I was assigned the blog A Kitchen Hoor, full of tons of great recipes, many of which are lighter (which I love!). As y’all know, I’m a huge sucker for any sort of comfort food pasta meal, so when I saw her recipe for a healthier Chili-Cheese Mac, I knew I had to try it. And y’all, it turned out SO good! It’s a perfect combination of flavorful chili beef + a lower-fat cheddar sauce, all tossed with diced tomatoes, green chiles, + pasta. As a pasta lover, I thought it was fantastic, and my chili-loving husband also gave it two enthusiastic thumbs up. And with only 350 calories per good-sized dinner portion (+ a great 25 grams of protein), it’s waistline-friendly while still tasting amazing. 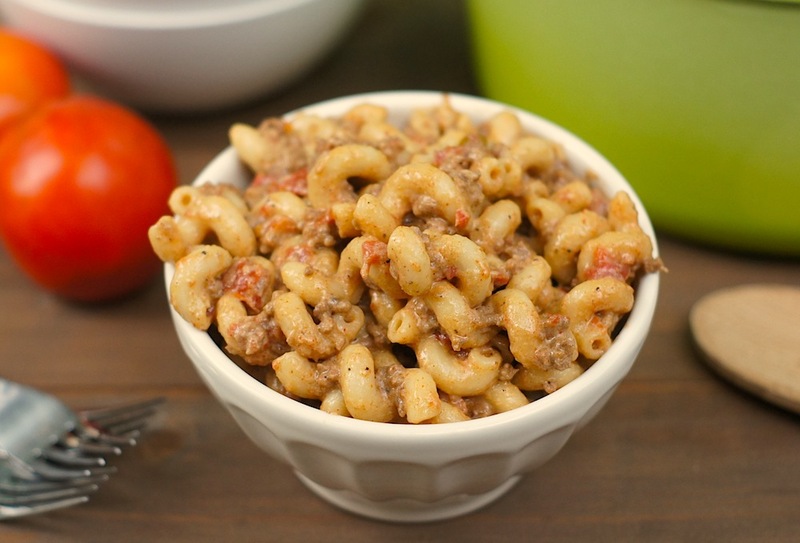 Thank you to Christine for introducing me to this wonderful Chili-Cheese Mac + to the Secret Recipe Club for connecting me, yet again, with fantastic bloggers + amazing recipes! For all my previous Secret Recipe Club recipes, click here – there are TONS of awesome ones! Heat a Dutch oven over medium-high heat. Add oil. Add beef + next 5 ingredients (onion powder, garlic powder, coriander, cumin, chili powder); cook until beef is no longer pink, about 8-10 minutes. Drain off any fat. Add broth, water, + tomatoes; bring to a boil. Stir in macaroni, reduce to a simmer, cover + cook 10-12 minutes, stirring occasionally, or until macaroni al dente. Serve hot with extra cheese, if desired. What a delicious and healthy combination! I always love reading what people make for SRC. This sounds like a perfect dish for fall…very comforting indeed. Hummmmm…. delicious looking mac and cheese, I love the spice kick and the reduction in calories! I’m with you – I love some comfort food! You combined two of my faves here, mac and cheese and chili sounds like a winning combo to me. Love that you reduced the calories in one of my most favorite recipes! This turned out so beautiful, great SRC pick! That looks so good and comforting! Love this healthier version. Great SRC choice! 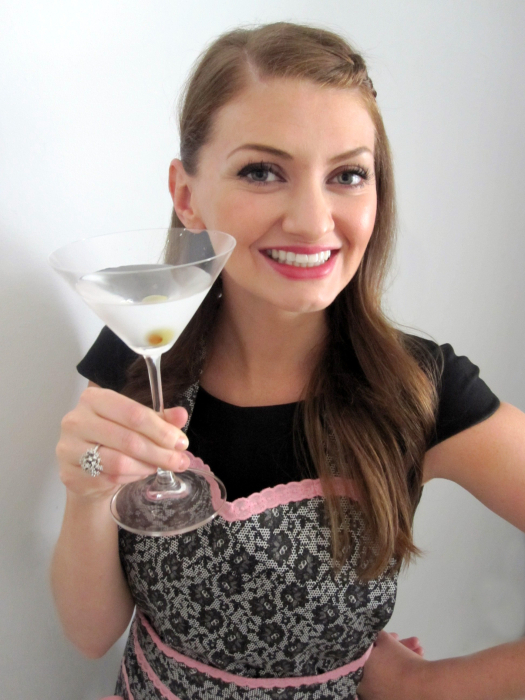 How fun Amy, your secret recipe club sounds fantastic, y’all have some tasty dishes lined up. I love chili and it looks absolutely delicious in your recipe! I am NOT kidding. I saw this on my Bloglovin this morning and thought it sounded like a good recipe. I OBVIOUSLY didn’t read the whole description (guilty of that ALL the time) or else I would have seen that it was one of mine. WOW. I am SO blonde sometimes. This was a good recipe…and SUPAH tasty! We usualy make it for out game day lunches. Mmmm chilli cheese my favourite! This looks fantastic! 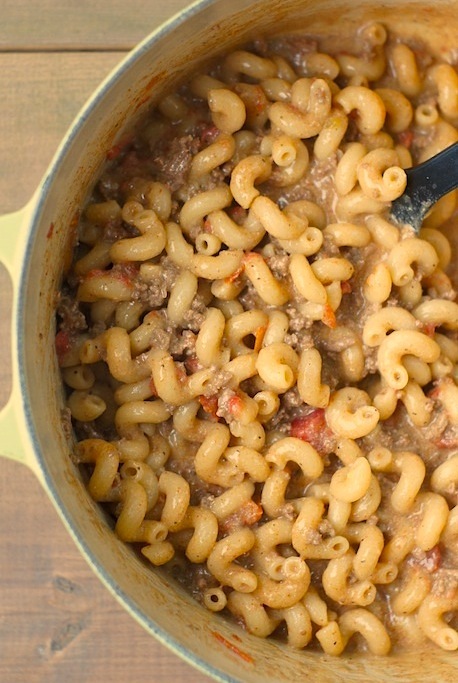 Who knew that healthier and chili/cheese/mac could title the same recipe?! LUV this comfort food! This looks amazing Amy! I love chili cheese macs. Looks so hearty and delicious. I can eat a big bowl of it! Pinning! Have a great week. This reminds me of a favorite recipe from my childhood. Thanks so much for sharing!! I love mac and cheese and this looks like a great version! Love how it’s lightened up..great SRC pick! Yum – this is a definite comfort dish. I know my husband would really enjoy this meal! LOVE this recipe, Amy!! It’s now on my menu plan for next week, since this is something my picky eater will actually eat! this is the perfect kind of meal for fall…love trying different versions. What a wonderful dish…has comfort written all over it. This sounds great to me. Easy to do, and full of flavor. Love it! The indian version of this is called “keema macaroni” but this one look much better than what I make. Love it! Yum! This looks perfect for fall! Looks like a great weeknight meal to me! I love to find healthy versions of favorite comfort dishes! Great pick this month!! Chili tastes great on everything! Oh yes! This is the kind of comfort food I can’t get enough of in the fall. Wonderful recipe, and I love that you lightened it up a bit. Thanks for sharing, Amy!